Born in New York City, New Jersey Symphony Orchestra Associate Concertmaster BRENNAN SWEET began violin studies at age 2 in Edmonton, Alberta. In 1977, he studied violin at the Franz Liszt Academy of Music in Budapest, Hungary. Beginning his college education as an engineering student at Washington University in St. Louis, Sweet transferred and earned a Bachelor of Music degree from Indiana University, eventually serving for three years as teaching assistant to Josef Gingold before joining the faculty for another two years as Lecturer. 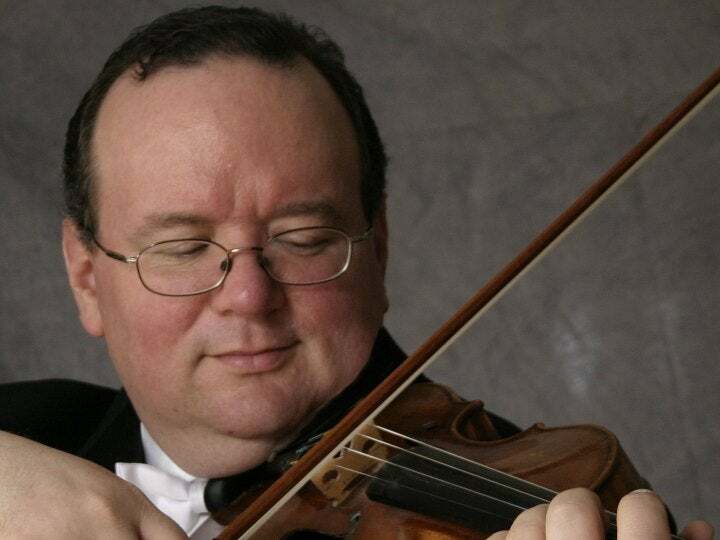 Concertmaster of several orchestras, including the Evansville Philharmonic Orchestra and Owensboro Symphony Orchestra, Sweet was also a founding member of the Evansville String Quartet. He performed for two seasons as Assistant Concertmaster of the Colorado Music Festival in Boulder. 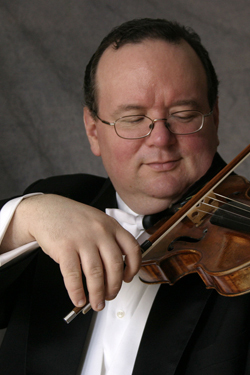 He joined the New Jersey Symphony Orchestra in 1994 as Associate Concertmaster and subsequently led the Orchestra for three seasons as Acting Concertmaster under Maestro Zdenek Macal. Sweet is a founding member of the Mostly Mozart at Monteux Festival in Hancock, Maine, and has served as coach and performer at the Raphael Trio Chamber Music workshop in New Hampshire. In 2007, he joined the faculty of Kean University as a Concert Artist, teaching students and performing chamber music concerts regularly throughout the year. Sweet performs recitals with acclaimed pianist Jenny Lin in the New York metropolitan area. MUSICAL INFLUENCE: Itzhak Perlman, Isaac Stern, Henryk Szeryng and the old masters. FAVORITE PASTIMES: Listening to various podcasts—some favorites are “NPR: Car Talk Podcast,” “The Clark Howard Show” and American Public Media’s “Marketplace Money”—reading novels and researching on the internet. RECOMMENDED READING: My favorite authors are Harlan Ellison, Isaac Asimov and Robert Heinlein. FAVORITE FILM: When Harry Met Sally. BRUCE SPRINGSTEEN OR BON JOVI: Early Springsteen—of course! BEST THING ABOUT THE EIGHTIES: Apple Macintosh. FAVORITE FOREIGN COUNTRY: Hungary. In 1977, when I was 15, I spent six months living with my family in Budapest while my father worked as an exchange scientist under NATO. I attended the “Liszt Ferenc Zeneakadémia”—the Franz Liszt Academy of Music—for violin lessons twice a week, and I studied chemistry and mathematics with my father, taking a correspondence course to satisfy high-school English requirements. I pretty much had free rein to explore the city on my own. The time I spent in Budapest was critical to my development on the violin—I had previously studied with only Suzuki-oriented teachers from age 2 until then. It was the first time I took lessons from a professional violinist (Karoly Duska of the Hungarian National Orchestra) and was exposed to the methodology of technical studies such as Kreutzer and Rode. FAVORITE ICE CREAM FLAVOR: Pralines and cream. GUILTY PLEASURE: Playing Rock Band on PlayStation 3 with the kids. IF YOU WERE A CRAYON, WHAT COLOR WOULD YOU BE? Green. ADVICE FOR YOUNG MUSICIANS: Practice every day, even if only for 15 minutes—surely there’s enough time for that! Make it fun, make it challenging, find music that speaks to you, go and see great musicians performing—you can learn a lot by watching them play. WHY MUSIC MATTERS: Try to imagine a world without music … it is all around us. Playing music with others is for me one of the great pleasures in life. The study of music also positively affects cognitive development in children, according to recent scientific studies. INSPIRED BY: My former teacher Josef Gingold, as well as all great artists in every genre and discipline.